It used to be that you could set your watch by Tony Blair. He would rise, blinded by his hubris to the ashes from which he was rising, at regular intervals to say one of two things. Either Labour must not shift to the left, or Britain should bomb another Middle Eastern country. And absolutely no one except John Rentoul would care. But now he has found a new calling and for some it may prove a compelling one: Tony Blair, the man who can lead the revolt against Brexit. The Tory government is hurtling towards the hardest of hard Brexits that few venting their understandable frustrations at out of touch Westminster elites and the political and economic system they preside over are likely to have voted for. Labour is failing to provide a coherent opposition to this and risks alienating Remainers as well as Leavers. Even as a Corbyn supporter, I thought his decision to impose a three-line whip (instead of offering a free vote) on the Article 50 vote even after Labour’s amendments had fallen was a mistake, accidentally offering Theresa May a blank cheque to turn Britain into a tax haven playground at the expense of its poorest people, no matter when the opposition thinks the real fight starts. In offering de facto support to the government on Brexit, Labour has left the field vacant and its once, and let us hope not future, leader has risen up once more to claim it. Across the pond, the same backlash against globalisation, immigration and the immiseration of working class communities has equally been exploited by right-wing populists to produce a similarly dangerous and destabilising result in the form of Donald Trump. And who should emerge from the woodwork this week to criticise Trump? 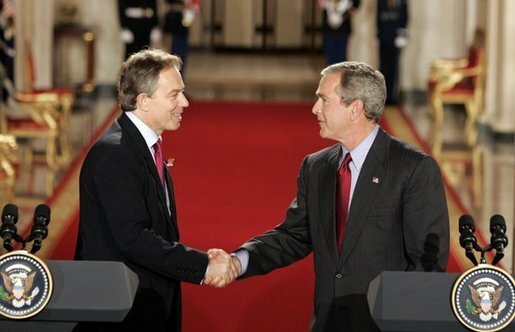 None other than Blair’s best warmonger friend, George W Bush, now looking almost presidential in hindsight. He came out against Trump’s immigration crackdown and attacks on the media – and he was right. Just as Blair was right to come out against the damage Brexit will do to this country. But these two men cannot be the ones to lead the countermovement against the economic, social and geopolitical climate of our age. They are the ones who created it. It was their neoliberal and neoconservative policies that helped shape a world of inequality and fear that could only ever be exploited by the populists. Their economic policies, a continuation of their Reaganite and Thatcherite forebears, comfortable as they were with reckless, deregulated greed, destabilised the financial system, unleashing a wave of misery on working class people forced to pick up the tab for the bankers. In desperation and abandonment, some have bought the empty promises of Trump and the Brexiteers. Their wars destabilised the Middle East, unleashing a wave of horrors on the region and the world. They led to the rise of Islamic State, and, in part, contributed to the Syrian Civil War and the refugee crisis we face today. Despite the stark contrast in rhetoric between Bush and Trump, despite 43’s insistence that the US was not at war with Islam, it is difficult to imagine the current climate of Islamophobia that the populists found so easy to stir and manipulate, without the ‘War on Terror’. In light of all that has come to pass since, it might be easy for liberals and progressive Europhiles to look back on the Blair era and see an age of plenty, before austerity, an age of openness, before the Tories turned us in on ourselves. For some, it might even be easy to look back now on Bush and, next to his Republican successor, see a statesman and a man of reason and tolerance. But Bush and Blair are part of the problem, not the solution. The field cannot be vacated to their likes. The centre-right drove us into a crisis the far-right was able to capitalise on. The left needs to show it can provide an answer: a genuine vision for improving the lives of people globalisation left behind when they find themselves once again betrayed and left on the scrapheap. Labour can do this in Britain. Corbyn’s ideas are well-placed to lead the way, even if the opposition has fumbled the Brexit ball in holding the Tories properly to account. It has to. Because if the left fails at this most crucial of junctures, if it lets the right do all the running again, the only Marx anyone will be quoting will be The Eighteenth Brumaire of Louis Napoleon. In the 30s and 40s communists, liberals and conservatives all united to fight Facists.